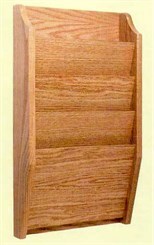 Ideal for holding medical charts and other large folders up to 12-5/8"W. Solid oak sides with matching laminate pockets. Satiny smooth lacquered finish. Use individually or side-by-side for extra storage. Mounting hardware included. Order the 1 Pocket Chart/File Rack here as No. Y1009; order other sizes below. 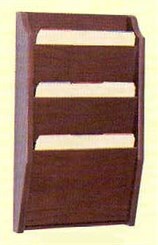 The 1 Pocket Chart/File Rack measures 14"W x 3-3/4"D x 12"H overall. Holds files up to 2" thick. Shpg. wt. 5 lbs. PRICE INCLUDES FREIGHT! Please allow 1-2 weeks for delivery. 1 - 2 $49.00 ea. Same as above except 15"W x 3"D x 11"H overall. Holds files up to 2" thick. Shpg. wt. 5 lbs. PRICE INCLUDES FREIGHT! 1 - 2 $84.00 ea. Same as above except with 3 pockets. Overall 14"W x 3-3/4"D x 24"H. Holds files up to 3/4" thick. Shpg. wt. 10 lbs. PRICE INCLUDES FREIGHT! Same as above except with 4 pockets. Overall 14"W x 3-3/4"D x 24"H. Holds files up to 3/4" thick. Shpg. wt. 10 lbs. PRICE INCLUDES FREIGHT! Same as above except with 5 pockets. 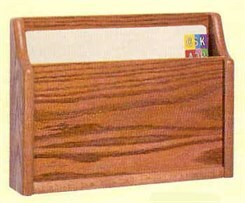 Overall 14"W x 3-3/4"D x 36"H. Holds files up to 1-1/4" thick. Shpg. wt. 14 lbs. PRICE INCLUDES FREIGHT! Same as above except with 10 pockets. Overall 14"W x 3-3/4"D x 48"H. Holds files up to 3/4" thick. Shpg. wt. 30 lbs. PRICE INCLUDES FREIGHT!